As a result much of the prose is in some kind of subjunctive (I guess, maybe not) or future perfect tense – and the sentences ramble and ramble, as Maria (our heroine) tries to figure out the psychology (I guess) of grief and being murdered. 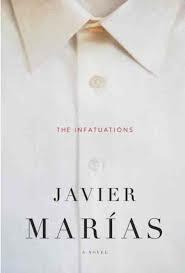 Perhaps the way Maria thinks is the way an author thinks – it’s a narrative of the author’s mind – (whose name is Javier – also an important character / Marias – close to the name of 1st person protagonist). About the title – who is in love or infatuated with whom here? Husband and wife, Maria and husband, Javier and Maria, Javier and Louisa – ??? All of the above? None? “…even the most transient and trivial of infatuations lack any real cause, and that’s even truer of feelings that go far deeper, infinitely deeper than that.” (p. 258) Kindle Edition. But about half way through Marias lets some suspicion fall rather darkly into the narrative, was the man’s death really as the police reported? How else could it have happened? And this leads to all the literary as well as crime-book questions – Is this the way good detectives and novelists think – as Maria is thinking? And this complex, tightly woven plot is what kept me reading – it turned out wonderfully well, but it’s a very, very literary type of crime novel. This was one of the rare ones where our tastes differed. Too much inner dialog for me. I did enjoy some of the side stories like Chaubert (?) the unwelcome lazarus and some of Maria’s gripes about her author clients. But at about 2/3, the only thing that kept me going was the prospect of rereading your review after reaching the conclusion. Thanks for sharing your reading experiences. Well thank you for reading my book responses and responding! I don’t suppose any two people will ever agree on all books. Happy reading!